Grilling season is beginning and corn is not yet available, so I had to find new things to grill for side dishes only because I’m too lazy to make something separate on the cook top. Other than mac and cheese. If I can figure out how to grill my 1 year old’s mac and cheese, we’ll be set for outside dining! Actually if you want an awesome kicked up mac and cheese recipe, try Emeril’s. Delicious! I make one with hot and spicy sausage and the cayenne and one with mild sausage and a dash of cayenne. 1. Take the cauliflower and trim off the leaves and core. Cut it into small florets and place those in a large bowl. 2. 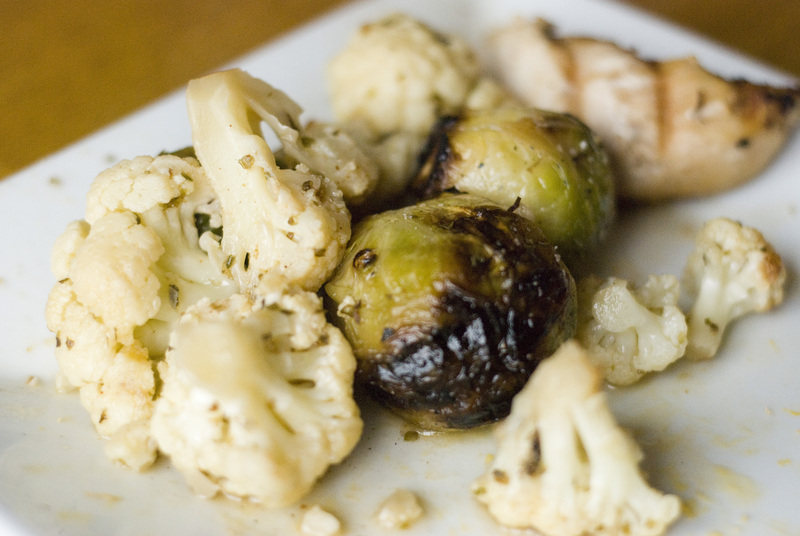 Add the olive oil and seasonings to the cauliflower and toss to combine. 3. Get out your aluminum foil and we are going to make a large packet pocket for the cauliflower. Take large sheet of foil, about 2′, and fold it in half. Do this again. Place the cauliflower in the middle of the sheet and place the other sheet on top. Crimp the edges shut. Cut 4 vents into the top. 4. Grill over medium heat for 12-15 minutes. Turn pouch and roast another 12 minutes. Test the cauliflower to make sure it is tender. Roast another 5 minutes if it is not tender/done. If it is, eat it! 1. Using a paring knife slice off the stems of the brussel sprouts and take off any black or yellow or yucky looking leaves. 2. Put the brussel sprouts into a microwave safe bowl and heat for 3 minutes. Then, toss the olive oil and seasonings into the brussel sprouts. 3. Once cool enough to handle, skewer the brussel sprouts. 4. Grill over medium heat 5 minutes. Turn and cook another 5 minutes. The grilled veggies sound really good!